I know I’ve always said I’m a ‘white kitchens only” girl. Don’t worry – that’s still true! 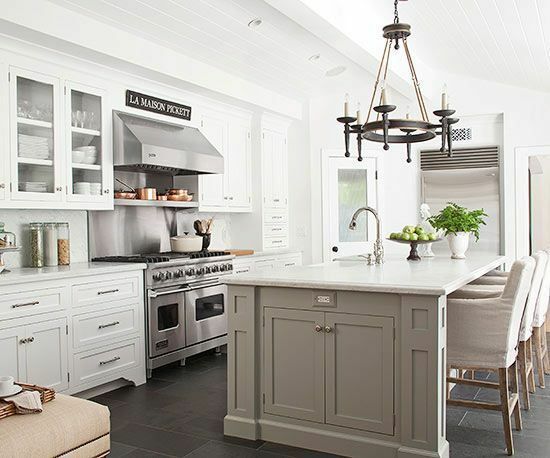 White kitchens will always have my heart. 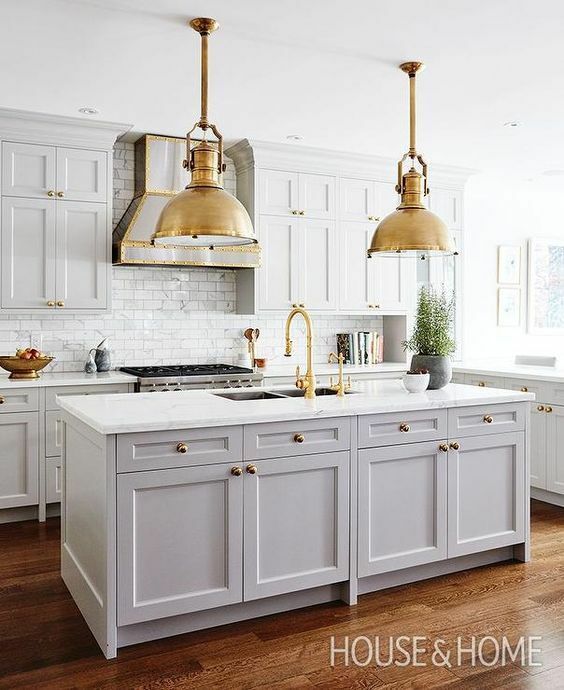 However, I thought some of you might be getting a little tired of seeing only white kitchens, so I thought I’d explore another look that I also really like. And that’s grey and white kitchens. 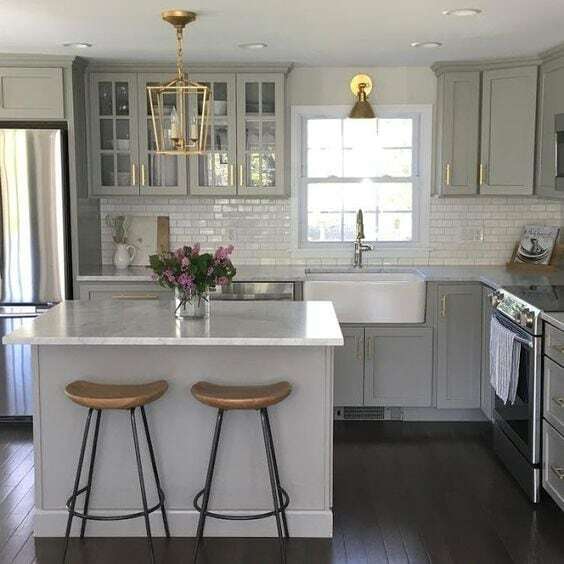 Sometimes it’s grey cabinets in part of the room, a grey island, a grey hood, or grey walls, but the mix of a soft grey with white is so beautiful! 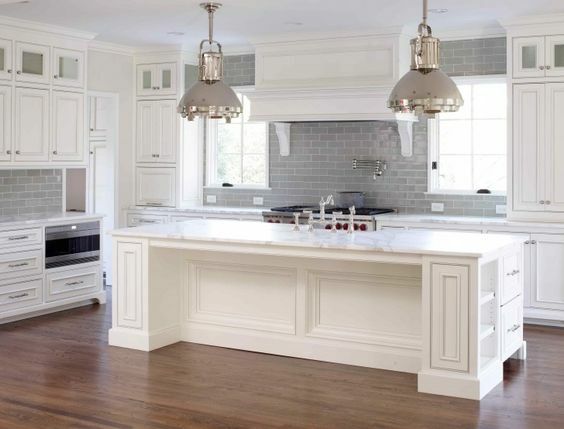 And for me, they still count as “white” kitchens because these aren’t predominantly grey. They’re a wonderful mix of the best of both colors. 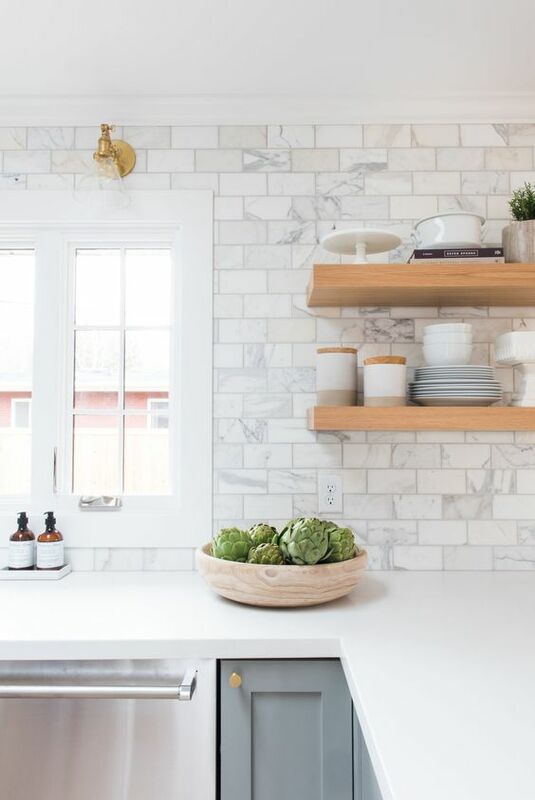 They’re mostly white kitchens with just a touch of grey, and they’re gorgeous! 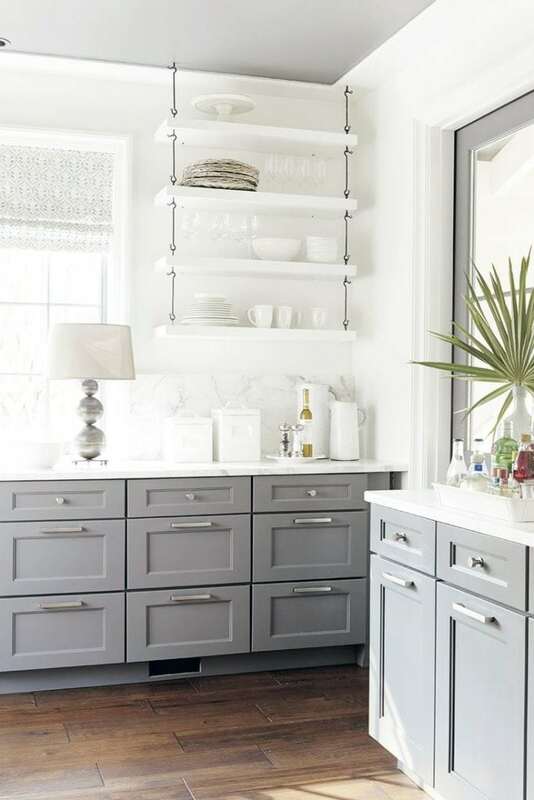 Grey and white kitchens are so popular right now that I could have found hundred or more photos to share! Here are just a few stunning examples…. 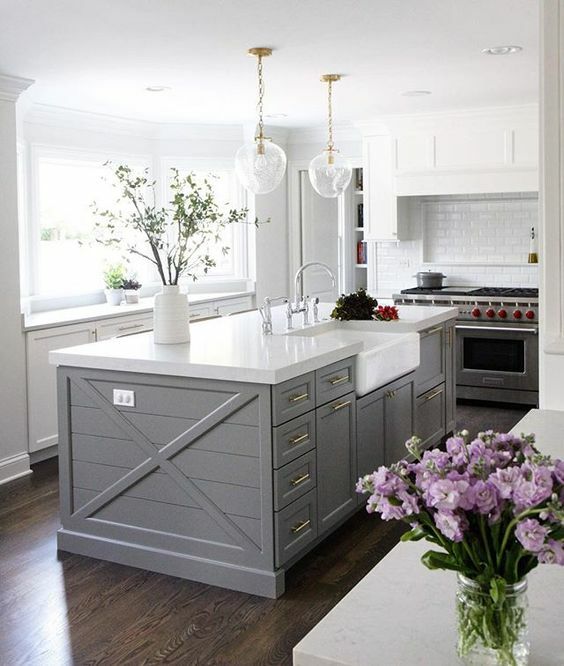 The perfect grey and white kitchen with just a pale grey island and the rest of the cabinets in white. Design by Tom Howley. 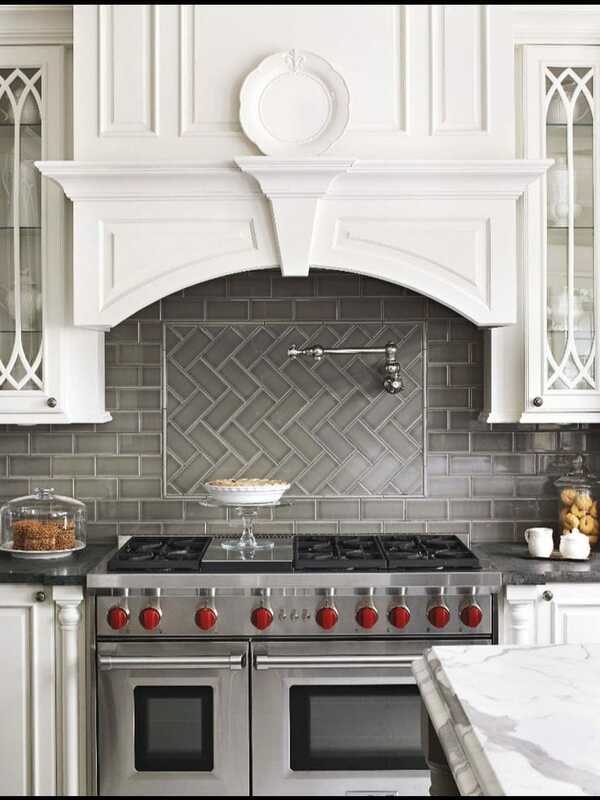 Love the grey glass subway tiles combined with all the white. Stunning! L. Kae Interiors. 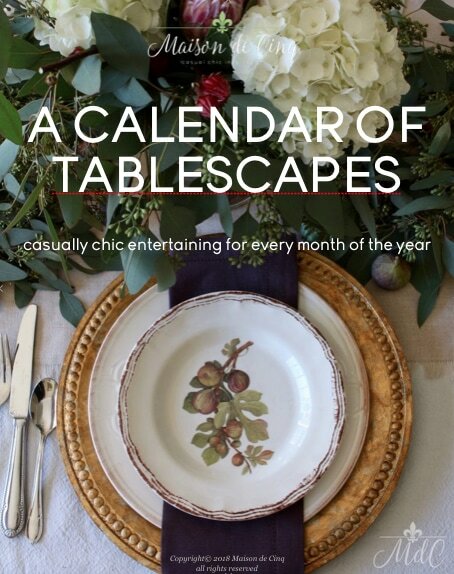 A definite favorite designed by the uber-talented Suzanne Kasler. 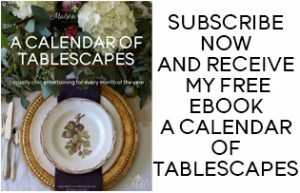 Via the Southern Living Idea House. Urban Grace Interiors via Decor Pad. Another grey and white kitchen with a grey island only. 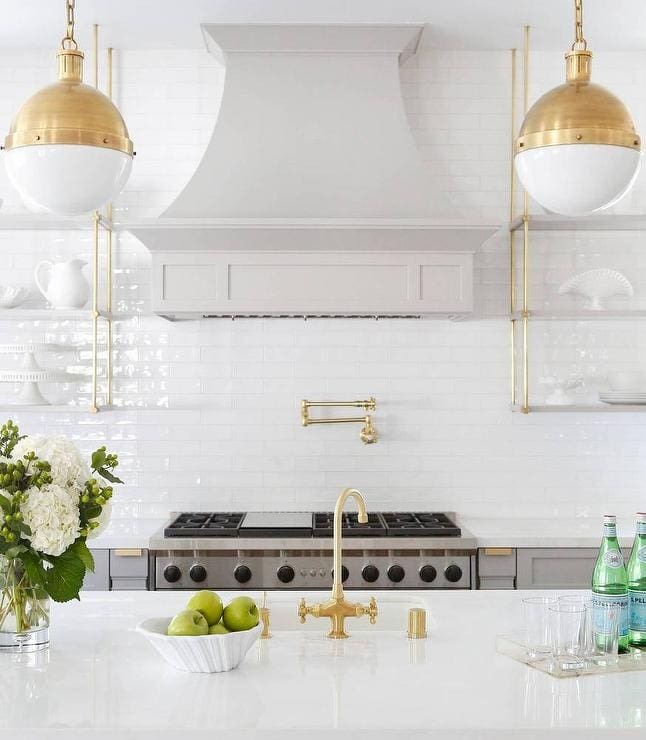 Love those brass pendants! Via House and Home. One of my absolute favorites! 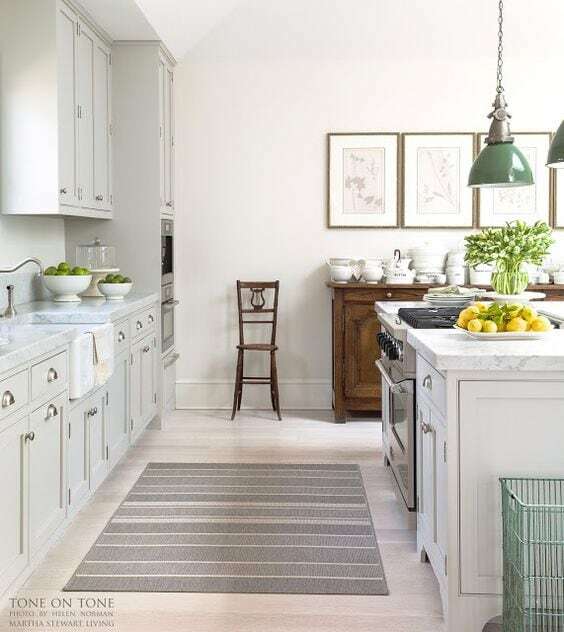 An otherwise off-white kitchen with a beautiful grey green island. Via At Home in Arkansas. Design by Joanna Gaines via HGTV. Again, loving that only the island is grey. And those lanterns!! 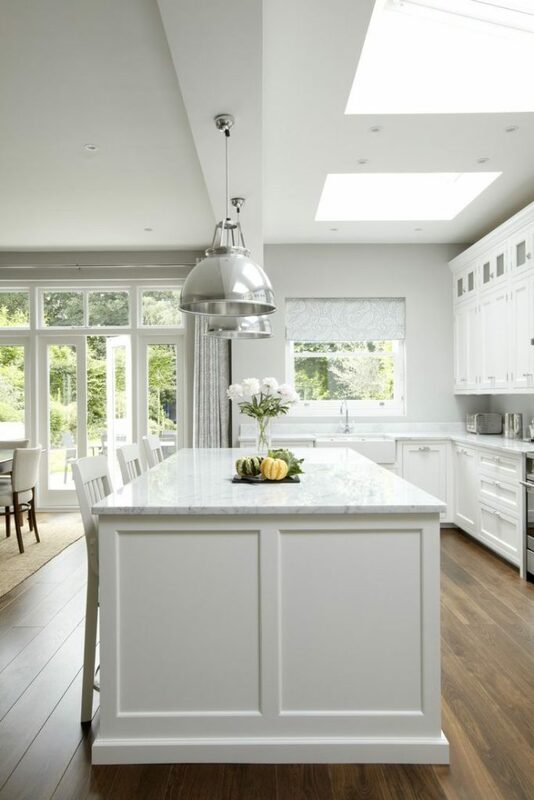 Stunning grey and white kitchen! O’Brien Harris via Decor Pad. 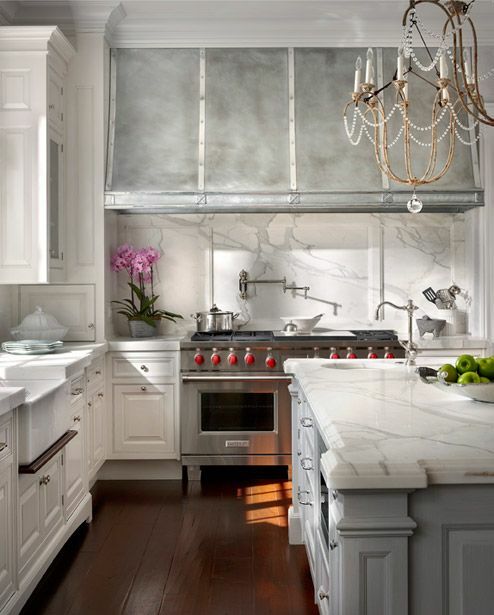 Love this kitchen belonging to designer Loi Thai of Tone on Tone. 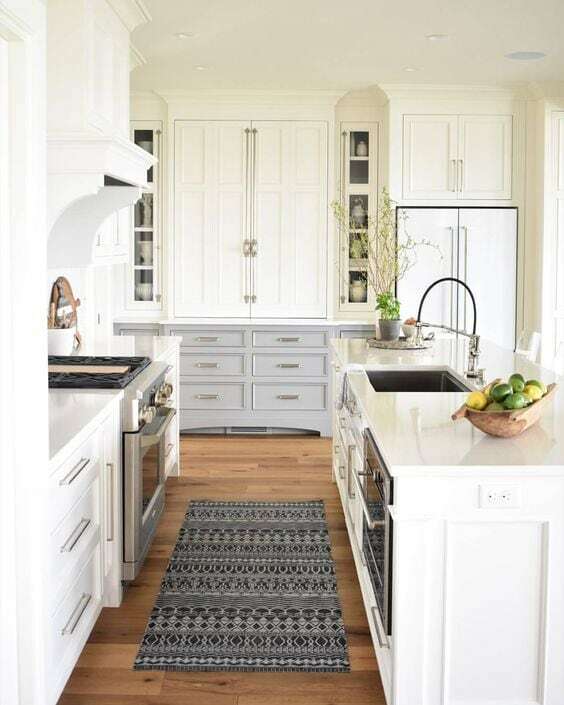 The cabinets are pale, pale grey with white marble counters. Gorgeous! 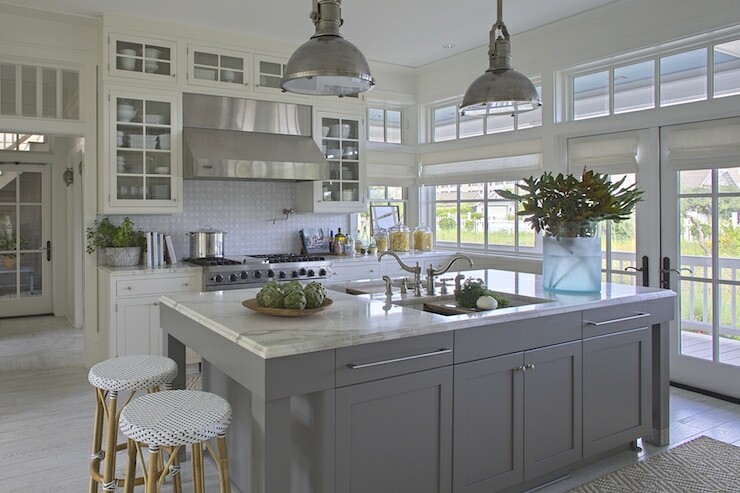 Beautiful beach house kitchen by designer Mary Ann Pickett of Classic Casual Home. Grey and gold so well together. You can see my post on more inspiration of that trend here. Design by Heidi Piron. Park and Oak Interior Design via Decor Pad. 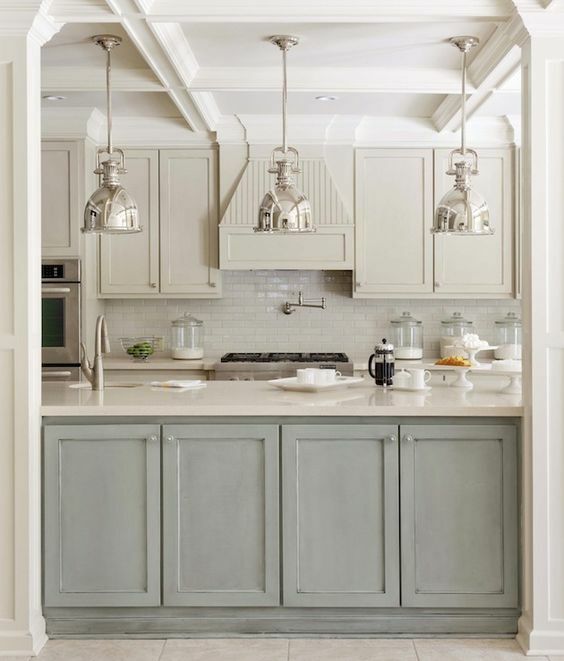 Love the paint color of the grey in this grey and white kitchen. By Kate Abt Design. 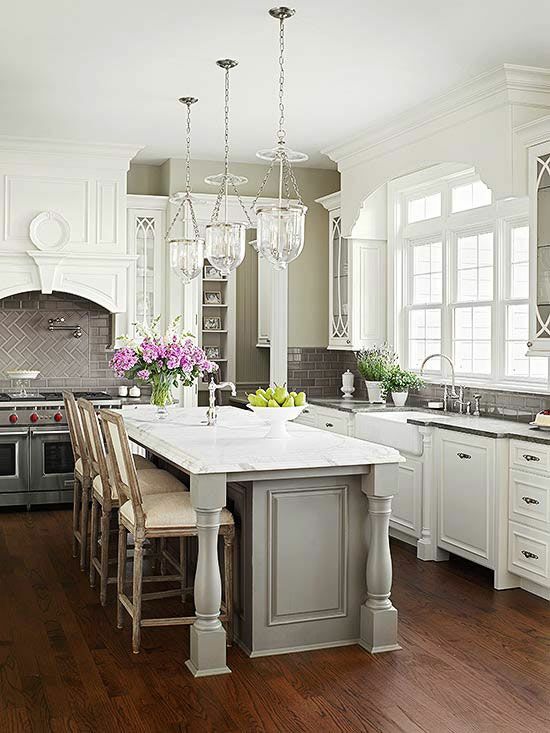 Gorgeous kitchen from Elements of Style blog. And of course, all the gold and brass looks great with the greys. Via Domino magazine. 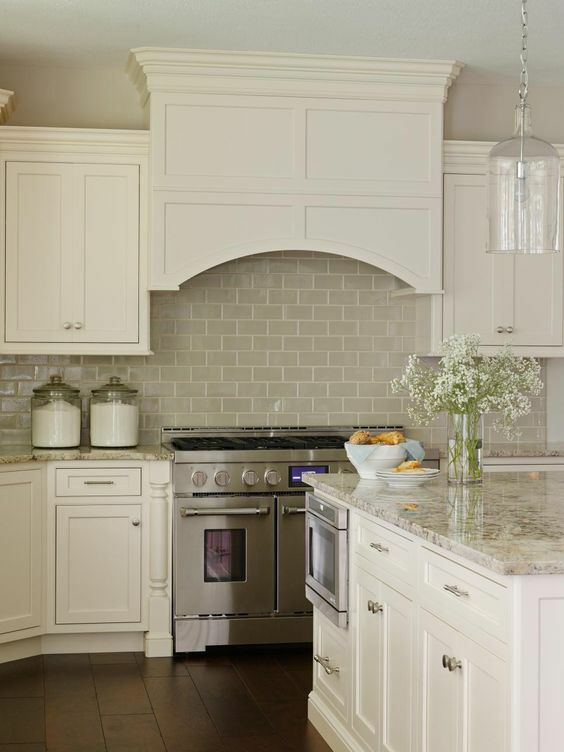 Here the cabinets are white with the walls painted the palest of pale grey. I’m beyond in love with this! 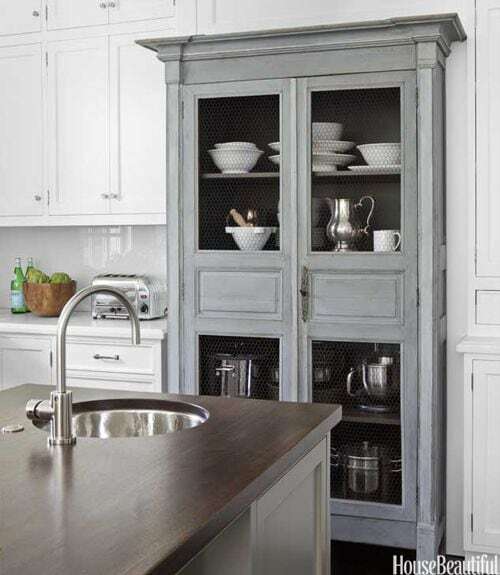 The wood counters and white cabinets with that gorgeous antique grey armoire built into the wall. 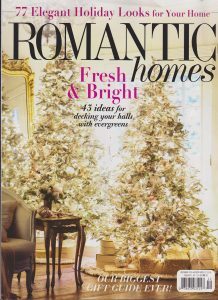 Design by Samantha Lyman Via House Beautiful. 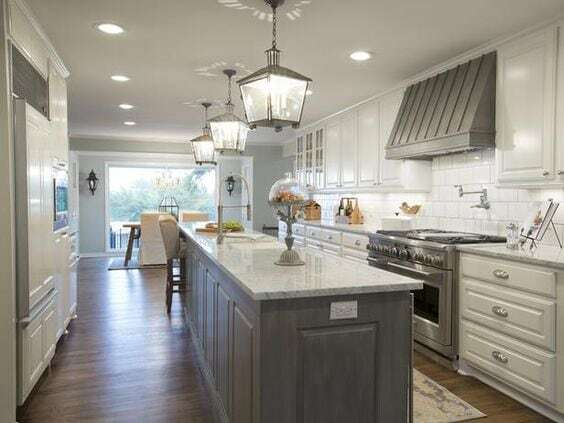 I especially love when most of the kitchen is kept white, and the island is grey. But as you can see above, just a little grey in any area really breaks up all that white and keeps it from being too monochromatic. If only I had an island, I might be tempted to paint it! I would love to see the rest of the house: the second one from the end of the list. It looks like something I would love. Me too! It’s a great one! 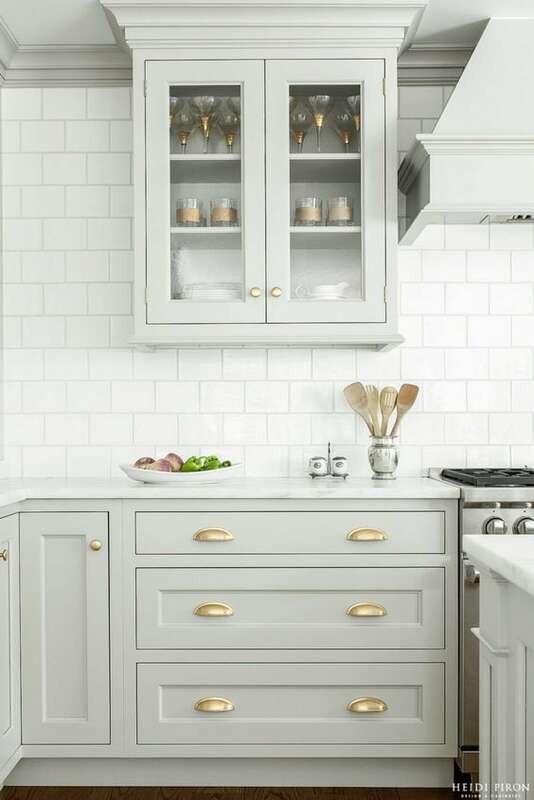 I love white kitchens too and the more cabinets the better. Not a fan of open shelves. Thanks for sharing these BIG beautiful kitchens. Mine is rather small. yes love all of these!! 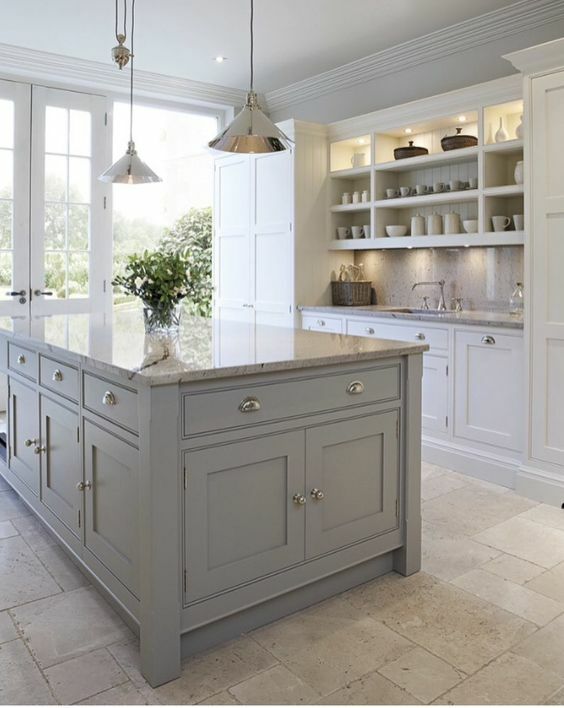 I am going to be doing my kitchen in grey and white too – grey for the island only! Yay Angelina – love it! I can’t wait to see it, I bet it’s going to be amazing!